In the heat of the moment when the ball bounced I did think "please be a ground rule double". Now admittedly I didn't know the ground rules of the stadium but the umps should. ESPN is really hammering the umps today vis a vis the playoff implications. I like it. Yeah, I was annoyed that Duvall missed the cutoff man, which allowed a slow Matt Carpenter to score from first. Cards fan here. I know the ground rules for that particular play are confusing, even for Cardinal fans. 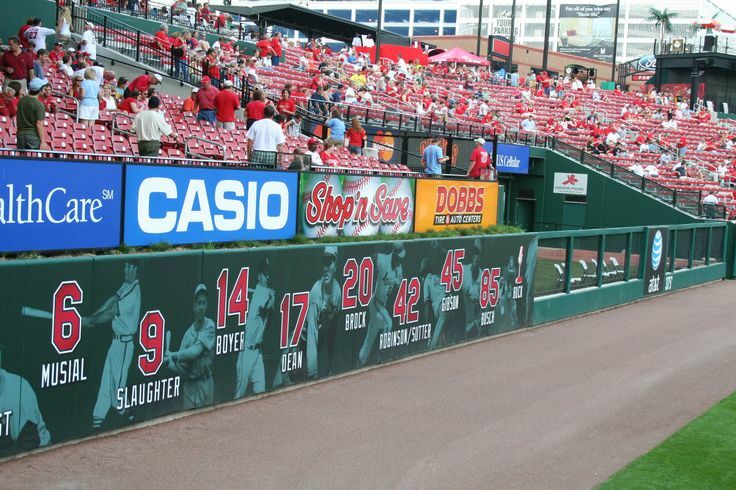 Here is a pic of that left field wall from the side. You can see there is an area of grass between the front wall and those signs. If somebody hits those signs behind the wall on the fly, it is a home run. It's hard to see from the normal camera angle during the game. It looks like those signs are right on top of the wall. But they are a bit behind. So a ground rule double would have been the correct call for last night, if the umpires had seen it. All stadiums have some weird ground rules, and that is one for St. Louis. Personally, if they are going to do that, I think they should at least have a yellow line or something to indicate where the home run line is. I think the outfielder would have been more likely to put his hands up and declare a double if that was the case. And the umpires probably would have reviewed it. Lots of things had to happen for the Cards to win on that play. Umpires missed the call. Outfielder didn't know the ground rules, or missed where it hit. 3rd base coach didn't see it. Manager didn't see it and didn't make an immediate challenge. And having to make an immediate challenge is kind of a questionable rule to me, since replay is supposedly there to make the correct call. RedbirdPat, that includes you, but you seem like an ok guy nonetheless. This was anti-pine tar. The pine tar incident happened because Nettles and Martin were really sharp and were just waiting for the right time to call it. Last night happened because Bryan was asleep at the switch. (Would it be wrong to add "as usual").